This boilie is probably the best remembered bait of the eighties with many anglers all over Europe on it. It accounted for huge numbers of fish including many PBs, and caught from tough waters here in the UK as well as the new waters overseas where Carp had yet to see any boilies. A blend of Peanut and Tigernut meals with brewers yeast, Betaine, milk powders and bird foods topped off with blended nut oils and the original Peanut Pro flavour. Write a review about "Retro Range Peanut Pro | Boilies | 15mm | 2.5kg"
We want to know your opinion! 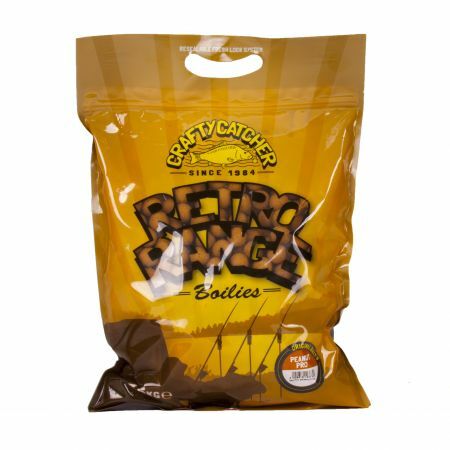 Write a review about the product “Retro Range Peanut Pro | Boilies | 15mm | 2.5kg”. Please note: this review is about the product and not about the store, delivery, etc. If you want to share your opinion about our service, positive or negative, you can contact us directly.